I once exchanged emails with el Bulli. If you’re one of the increasingly few people on Earth who have not heard of el Bulli, it’s a restaurant on an isolated bay called Cala Montjoi on Spain’s Costa Brava, a couple hours north of Barcelona. And even if you’ve not heard of it, you’ve been eating its influence whether you recognized it or not for years. It’s often called the greatest restaurant on earth. I had dreams of visiting el Bulli. I was considering planning a vacation to Spain around it should I be one of the lucky 8,000 to get a reservation from the 2,000,000 requests they get each year. The restaurant’s creative genius, Ferran Adria, is no less than food’s answer to Pablo Picasso. Just as Picasso forever changed our concepts of the human form when he exploded apart five nudes in Les Demoiselles d’Avignon, Adria revolutionized cooking and dining when he began deconstructing dishes at his kitchen in Catalan. The world had never before seen a frozen parmesan foam, a gel “olive” with liquid inside, a vaporized martini, an air baguette, spherical melon “caviar” in a jamon consomme. Most folks had never before eaten with tweezers. Ferran Adria says “Creativity is not copying.” But Einstein also famously said, “The secret to creativity is knowing how to hide your sources.” How do we reconcile these opposing truths? Adria will acknowledge the influences — Japanese cuisine, for example — in his culinary art. A large part of creativity is seeing connections where others before you have not. I like to think of myself as a modernist. I’m intrigued by the avant garde. At the same time, I’m deterred by the flood of imitators, which is not to my mind creativity but jumping on a bandwagon. (We have a chef in Topanga who is deconstructing shrimp cocktails.) But the artist in me likes to push myself creatively. I like to imagine food combinations I’ve never had before. I’m conscious of the interplay between flavors, colors and textures; I sometimes combine French techniques with Asian ingredients. 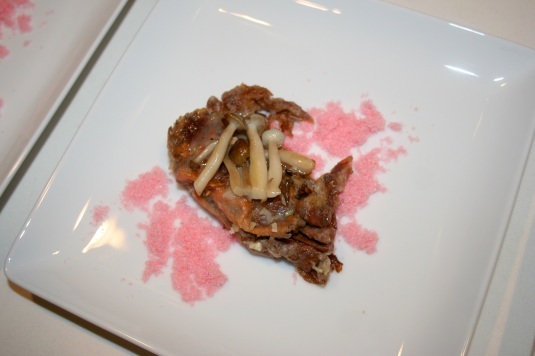 Guests at my New Year’s Eve dinner this year were surprised to find crunchy soft shell crabs on beds of fluffy pink Japanese sakura denbu fish powder; “clouds” of duck rillettes, truffles and potato mouse; and Proscuitto di Parma with winter melon & Calpico soda gels. I’ve got a fun idea to do an edible chess set, shellfish vs. braised meat. All of which can trace back indirectly to el Bulli. But most days, my creativity leans toward looking for interesting ways to make a new kind of pizza or creating a risotto I’ve never done before. Being avant garde takes too much time. 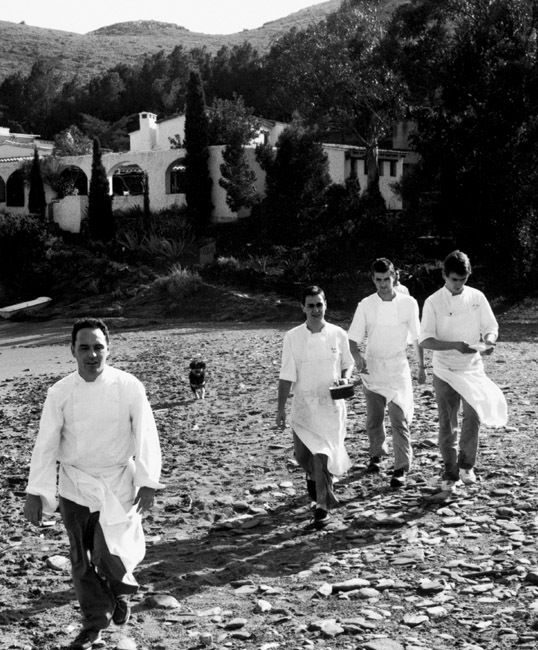 el Bulli is closing in July, 2011. And the world is forever changed. In 2014, Adria will re-open el Bulli not as a restaurant but instead a creative think tank and experimentation foundation. In addition to chefs, on staff and visiting, he will invite artists, architects, scientists and other “collaborators”. Perhaps I will one day make it to Cala Montjoi in this capacity. 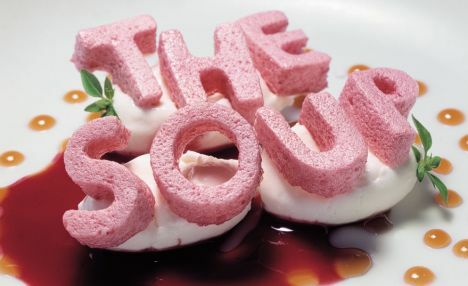 Learn more about el Bulli. Tex/Wasabi in Santa Rosa is a Tex/Mex/Sushi restaurant. Guess who owns it. I looked it up on line. That looks a couple notches down from el Bulli. ; ) Do you know the owner? Says he’s a Food Network guy? That’s great, M-M — thanks for sharing it.